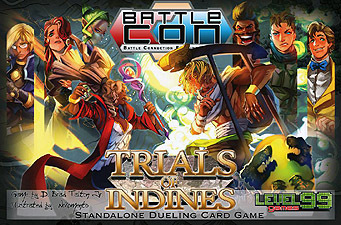 Battle Connection: Trials of Indines is a stand-alone game that captures the thrill of head-to-head battles between two skilled fighters. BattleCON brings intense strategic dueling action to the tabletop, with a vast array of fighters, each boasting a unique ability that completely changes the game! Every character can utilize up to 35 different moves in combat, and each brings a powerful new play mechanic to the table that completely changes the game and forces you to fight in different ways. Unleash psionic powers, clone yourself, steal opponents' skills, and even resurrect from death to achieve victory! Choose your fighter, and get ready to do battle!